Check out major holiday happenings for 2018, beginning with the Macy's Thanksgiving Day Parade on NBC television beginning at 9AM ET on Thursday, November 22. Joining the big holiday festivities at the parade this year will be the traditional bevy of stars from the world of rock, rap, and country music, along with excerpts from live Broadway productions scheduled for the 92nd annual parade. As always, look for a world class performance by the Radio City Rockettes, and of course, a special appearance by the one and only Santa Claus! Just up ahead, take an online tour of what else is going on - coast to coast - with times and locations of this year's big Thanksgiving Day events. If you're staying at home to watch on TV, also be sure to stick around for the annual 2018 National Dog Show beginning right after the Macy's Thanksgiving Day Parade on NBC. 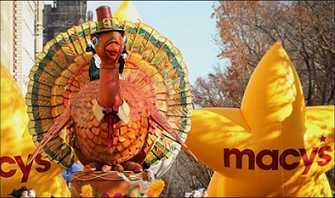 Macy's Thanksgiving Day Parade - The one that started it all, with details on New York parade history and info on the traditional helium balloon extravaganza, the full parade route, celebrity floats, marching bands, maps and best viewing locations, interactive online games and more. America's Thanksgiving Parade Detroit hosts one of the country's oldest parades, starting on Woodward Avenue and Mack, and ending at Woodward Avenue and Congress. Houston Thanksgiving Day Parade, Houston's big holiday extravaganza with the complete parade route, promo video and photos. Chicago Thanksgiving Parade - This year's complete schedule and parade route, VIP tickets, pics, video and a guide to parade volunteering and participation. Carolinas' Carrousel Thanksgiving Day Parade, Charlotte's march down Tryon Street including the complete schedule, updates and photos. Plimoth Plantation - The Massachusetts living history museum re-creates Thanksgiving with authentic 1627 theme dining and other activities. New England Thanksgiving and Victorian Thanksgiving dinners feature period food, table manners and customs. Old Sturbridge Village - Lots of activities throughout the month, with Thanksgiving Day events at this Western Massachusetts living history museum, including a re-created Meetinghouse service, a musket shoot, and storytelling.